In recent years, there has been a growing debate on the various ways that architecture and urbanism have served the triad of colonialism, nationalism and modernity. Some have argued that newly decolonized nations sought to represent their modernity through the spaces and symbols of their new national capitals, while other scholars have stressed that while the forms and processes of architectural modernization have no doubt served as aids to various nation-building projects, it is the specific role of individual agents (such as planners, architects, an emerging twentieth-century bourgeois citizen, or colonial administrators) in this national project that needs attention. However, many such explorations of this subject have so far taken the form of monographs that concentrate on one city, thereby limiting the scope required to address the broader questions at hand. By juxtaposing case studies from various colonial and postcolonial settings from around the world, this edited volume provides a comprehensive and diachronic investigation of the ways in which architecture and urban space mediate the intersections of colonialism, nationalism, and modernity. Examining such spaces as archaeological sites, memorials, new buildings, or historic urban fabric, the book questions certain established dichotomies such as that of the imperial center and the colonized periphery; the colonial past and the postcolonial present; or the isolation of the national or local from the global. Besides offering unique historical perspectives on colonialism, nationalism and modernity, each case-study also reassesses theories regarding memory and monumentalization; the appropriation and deployment of tradition in the service of nationalism; and the institutions of modernity. A common thread throughout the essays in this volume is a focus on new loci of power that emerge either in collision with colonial power structures, or in collaboration with or those that emerge in the wake of decolonization. While the authors recognize the presence of a larger structure of colonial hegemony, they also investigate those centers of power that emerge in the interstices of crevices of colonial power. Interdisciplinary and theoretically innovative, this book offers a global perspective on colonial and national landscapes, rewrites the master creator narrative, examines national landscapes as sites of contestation and views the globalization of processes such as archaeology beyond the boundaries of the national. 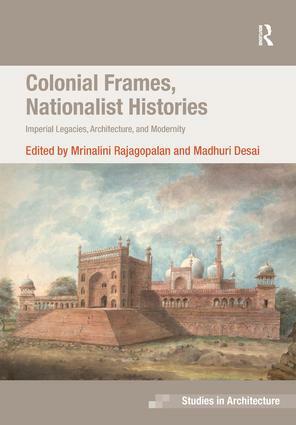 Contents: Foreword; Introduction: architectural modernities of imperial pasts and nationalist presents, Mrinalini Rajagopalan and Madhuri Desai; Section 1 Colonial Taxonomies and the Nation's Episteme: Making Indian modern architects, William Glover; In search of the sacred and antique in colonial India, Madhuri Desai; From colonial memorial to national monument: the case of the Kashmiri Gate, Delhi, Mrinalini Rajagopalan. Section 2 Imperial Designs and the Nation's Fragments: Comparative alterities: native encounters and the national museum, C. Greig Crysler; The Black Atlantic and Georgian London, Richard W. Hayes; Almost, but not quite: architecture and the reconstruction of space in the Territory of Hawaii, Kelema Lee Moses. Section 3 Global Vocabularies and Local Products: Redefining the dual city: changing ideas of plural citizenship in colonial/postcolonial Singapore, Anoma Pieris; Beyond racialized representation: architectural linguÃ¦ francÃ¦ and urban histories in the Kampung houses and shophouses of Meleka and Singapore, Imran bin Tajudeen; Between typologies and representation: the Tong Lau and the discourse of the 'Chinese house' in colonial Hong Kong, Cecilia Chu; Postcolonial Shanghai: an urban discourse of prosperity and futurity, Andrew Law; Index.